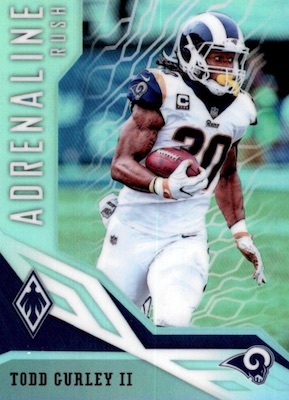 Year three of the distinct NFL set sees 2018 Panini Phoenix Football soar to mostly familiar heights. Hobby boxes feature three hits, including an expected output of two autographs and one relic per box. 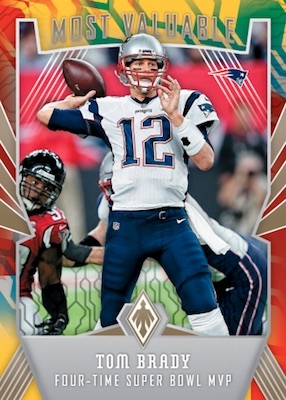 Showcasing players from all 32 teams, the 2018 Panini Phoenix Football checklist offers 100 veterans and 100 rookies (1 per pack) in the 200-card base set. 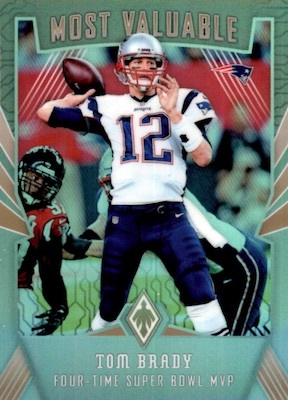 Among the parallels are numbered Red (#/299), Pink (#/199), Purple (#/149), Orange (#/99), Yellow (#/75), Green (#/25), Black (#/10), Blue (1/1), Printing Plate (1/1) versions. 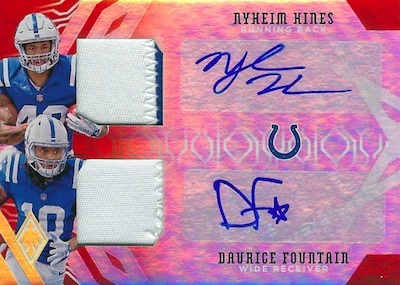 Parallels combine to fall one per pack. 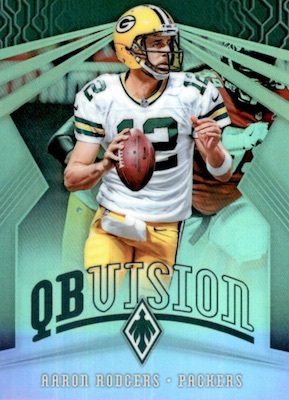 The inserts, which average nine per box, include Adrenaline Rush, Agility, Most Valuable, QB Vision, and Unmatched. Similar to 2017, collectors can again chase Color Burst parallels across the base set, and this colorful parallel now extends to the inserts. Found in hot packs that average one per box, the insert versions are even tougher to uncover. 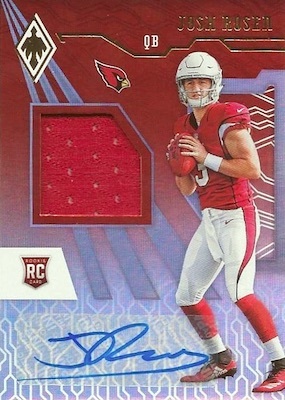 Emphasizing first-year talent, 2018 Panini Phoenix Football is loaded with rookie hits and each box should have one auto relic for a 2018 rookie player. The selection consists of RPS Rookie Auto Jersey (#/299 or less) and RPS Rookie Jumbo Auto Swatch (#/149 or less). 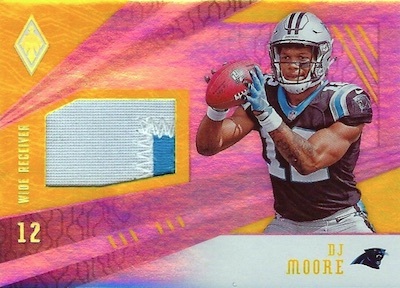 Each card offers Orange (#/149 or less), Yellow (#/75 or less), Green (#/25 or less), Blue Super Prime (1/1), Laundry Tag (1/1), Brand Logo (1/1), and NFL Shield (1/1) parallels, as well. The Rising Rookie line (#/299 or less) mixes in various gear alongside the signature while adding one-of-one NFL Shield, Nike Swoosh, Team Logo and Vapor Jet editions. 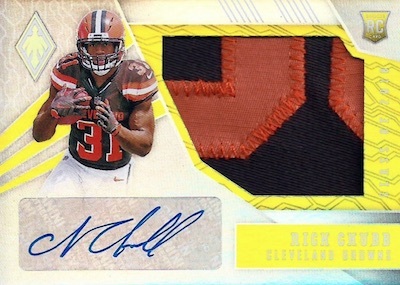 Packing in the autographs and swatches, the Dual Patch and Triple Patch Autographs sets are focused on notable NFL trios. Averaging one per box, the relic options include RPS Jumbo Memorabilia cards for the rookies and Veteran Materials cards for the seasoned stars. 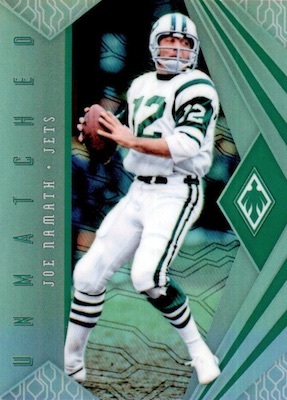 The base versions are limited to 199 copies (or less), with Purple (#/75 or less), Prime Yellow (#/25 or less), Prime Green (#/10 or less), Super Prime Blue (1/1) parallels. 2018 Panini Phoenix Baker Mayfield Rookie Auto Nike Patch True 1 1!!!! PARALLEL CARDS: Color Burst (1:6 packs), Red #/299, Pink #/199, Purple #/149, Orange #/99, Yellow #/75, Green #/25, Black #/10, Blue 1/1, Printing Plates 1/1. Shop 2018 Phoenix NFL autographs on eBay. PARALLEL CARDS: Orange #/199 or less (No Ballage*), Prime Yellow #/75 or less (No Ballage*), Prime Green #/25 (Lamar Jackson #/15*), Super Prime Blue 1/1, Brand Logo 1/1, NFLPA Logo 1/1, NFL Shield 1/1. PARALLEL CARDS: Orange #/99 or less (No Ballage*), Prime Yellow #/75 or less (No Jackson,Ballage*), Prime Green #/25 or less, Super Prime Blue 1/1, Brand Logo 1/1, Laundry Tag 1/1, NFL Shield 1/1. 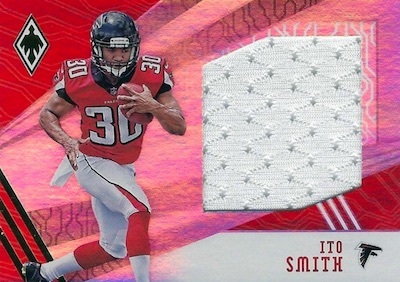 PARALLEL CARDS: Gloves #/99 or less, Helmet #/25 or less, Helmet Logo #/3, Nike Swoosh 1/1, NFL Shield 1/1, Team Logo 1/1, Vapor Jet 1/1. PARALLEL CARDS: Super Prime 1/1. 40 cards. Serial numbered #/100. PARALLEL CARDS: Purple #/75, Prime Yellow #/25, Prime Green #/10, Super Prime Blue 1/1. 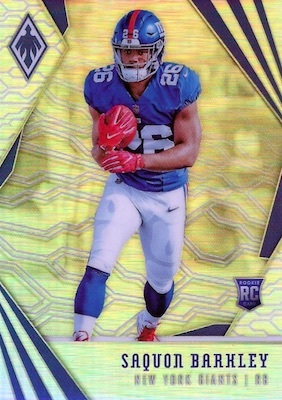 PARALLEL CARDS: Purple #/75 (No Ezekiel Elliott*), Super Prime Blue 1/1 (No Drew Brees*). 11 Prime Yellow and 12 Prime Green parallel cards. PARALLEL CARDS: Color Burst (1:60 packs), Red #/299, Pink #/199, Purple #/75, Orange #/49, Yellow #/25, Green #/10, Blue 1/1. PARALLEL CARDS: Color Burst (1:120 packs), Red #/299, Pink #/199, Purple #/75, Orange #/49, Yellow #/25, Green #/10, Blue 1/1. PARALLEL CARDS: Color Burst (1:40 packs), Red #/299, Pink #/199, Purple #/75, Orange #/49, Yellow #/25, Green #/10, Blue 1/1. View the full 2018 Panini Phoenix Football checklist spreadsheet. I like the slick look they have hope I can pull a Patrick Maholmes. it going to be like Christmas time opening presents. yeesh. These look like an undergrad computer graphics design. 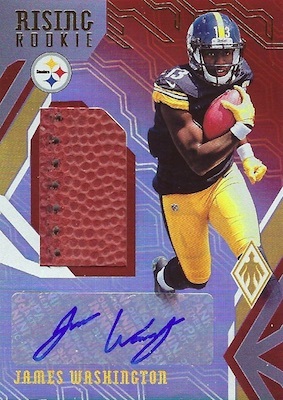 Advice to Panini: cut the number of Football sets in half and pay the extra money to have on card signings. This is just another run of the mill set with Sticker autos. In the future who is going to care if it is an Illusions, Impeccable, Phoenix, Obsidian, Onyx, Delusions, Meteorite, Plutonium, or Unobtainium card. Stick with the tried and true sub-brands. All of these new sets look the same and are really not desirable. ‘Advice’ to all collectors.. in response to above. Panini is not going to stop making so many sets –until customers stop buying some of them. 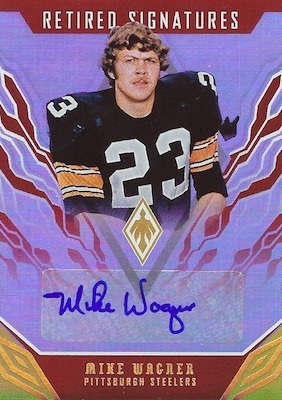 Back in the day – when each card company made one set per year, the First Card made was the Rookie Card – there was not hundreds of different Rookie cards per player. 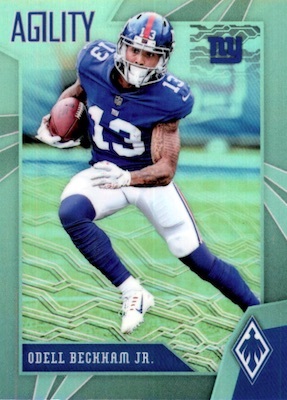 The market demand should change to only want the FIRST card made from the FIRST SET made as that is the only Rookie card – but the problem is those sets come out in College Uni. 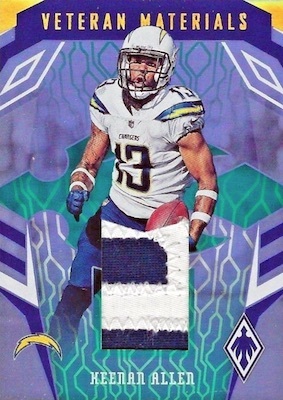 The first card in NFL Uni should be the only set RC anyone should care about and maybe with that Panini wont make so many sets. but then you wont pull all those different cards that you love pulling all year long. Bought a three boxes and the break was what I thought it would be. Set if full of one color swatches, which is a bummer. Way, way to many parallel cards so almost impossible to finish the set. I would have give this four star is there were not so many parallel cards. For the record you can’t blame Panini for the number of releases. I believe it’s a requirement of their NFL license. 25 release each year I believe. I don’t like it either, but blame the correct parties. 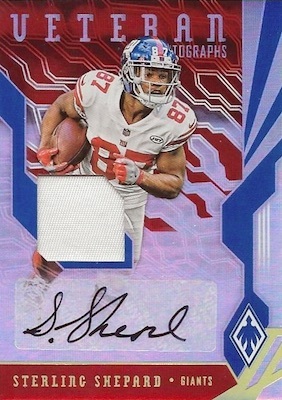 With that said, for the love of God, please cut back on the sticker autos and put more on card autos in your product. Well, they made almost 40 sets last year and looks to be the same or more this year. Quality control seems pretty solid, There is a bunch of color, which can be tough to keep track of for someone new to the product.